This General Tso Chicken Recipe is an incredibly flavorful Chinese chicken recipe. It is a delicious, lightly fried, Chinese style chicken that is crispy, sweet, and slightly spicy. 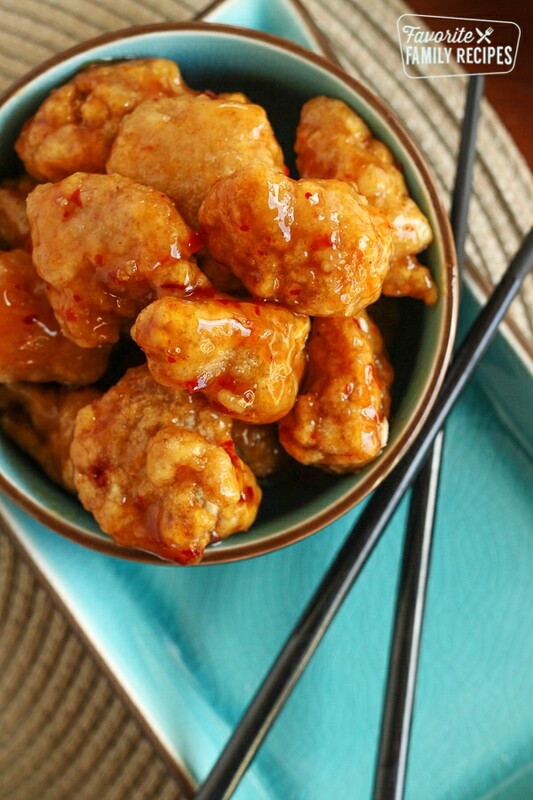 Jared and I love this General Tso Chicken recipe! This is actually the first meal Jared ever made me. He made it for me back when we were dating. How lucky am I to have a husband that loves to cook! With a recipe as good and easy as this, you won’t ever have to, or want to, order-out for Chinese food again. Jared actually worked for a Chinese take-out restaurant when he was in high school. He learned how to make a bunch of the dishes, so keep a look out for some of his recipes when you are browsing Favorite Family Recipes. General Tso Chicken was his favorite to make and to eat when he worked there. Some people aren’t quite sure how to pronounce “General Tso.” Some say “General Cho”, others I have heard say “General Sow,” or even “General Toes.” I have always pronounced it “General Soh”, but Jared has always called it “General Chow.” I always thought he was way off but I have come to find out he is technically right. At the Chinese restaurant where he worked, it was pronounced “Chow” and the owners of the restaurant assured him that this is the correct way of saying it. There is the Americanized way of saying and the correct Chinese way of saying it, which is indeed “Chow.” No matter how you say it, people will figure out what you are trying to say sooner or later! Crock Pot Cashew Chicken: Needing an easy recipe to throw in the slow cooker? This is definitely a reader-favorite recipe. Such an easy weeknight dinner idea! Panda Express Chow Mein: Need a side dish to go with your meal? This is one of my favorites! Bonefish Grill’s Bang Bang Shrimp: This shrimp has got to be my favorite thing at Bonefish Grill, hands down. Guess what? It is SO easy to make at home-check it out! Chinese BBQ Pork (Char Siu): This is a delicious recipe for the smoker or grill. The pork is moist, tender, and flavorful. Sesame Chicken Stir Fry: This is a low-calorie option if you are craving Chinese food but want keep it on the healthier side. Anyway, back to the recipe. Now that we are married, General Tso Chicken is a favorite recipe for our whole family. Our kids love it! We love cooking it up with our Restaurant Ham Fried Rice and some steamed veggies on the side. We also like throwing pineapple right in with the chicken to make it go further. It is also delicious to add bell peppers or chili peppers in with the chicken. Do what you think your family would like best! This General Tso Chicken is full of incredible flavor. It is a delicious, lightly fried, Chinese-style chicken that is crispy, sweet, and slightly spicy. Dredge chicken in flour and fry in oil over medium heat (in a wok or a skillet) until golden brown and crispy. Drain excess oil. Sprinkle cayenne over the chicken and keep warm on low heat. Meanwhile, in a saucepan, combine sauce ingredients (sugar, soy sauce, pineapple juice, vinegar, garlic, and ginger) and heat gently. When sauce is smooth and sugar has dissolved, SLOWLY add cornstarch mixture and stir constantly until sauce has thickened to desired thickness. Pour sauce in the wok and stir to coat chicken. Stir in green onion and hot red pepper flakes (optional). Remove from heat and serve with fried rice. What a glorious dish. It exceeds all expectations! Can you come up with a fortune cookie recipe? I have tried, but I burn the fortune papers in the oven. You take the cookies out of the oven then put the fortune in and fold the cookie. Allow them to cool and they will hold their shape. You do not put them back in the oven with the papers. I just made this for my family tonight and it was a huge hit. So delicious! It is definitely going into my regular rotation! Dang, I want to make this RIGHT NOW, it looks so good, but I don't have all the ingredients!! 🙁 I need to go get some pineapple juice and ginger PRONTO so I can eat this soon! Here is a great fortune cookie recipe.Enjoy! I've got chow mein down but I would love to know how to make this favorite. Thanks for sharing. I'm going to try it this week. I only have Ginger powder on hand. Can you just use the same amount as the fresh? Or is it a bad idea to substitute in this dish? I buy 1 piece of ginger.. skin it, and chop it up.. then freeze it in a baggie.. Then whenever a recipe calls for fresh ginger, I just break of some from the freezer.. Otherwise you buy ginger, use a little bit, and the rest ends up going to waste. This way, you always have it on hand! I do the same w/ chilpotle adobe.. I only use a Tbs. at a time of chiplote.. so it gets frozen too.. and i just break off a small piece to add to dishes. @Kathy- You can still use ginger powder, just use like 1/3 of what the recipe calls for for fresh. You definitely want some kind of ginger flavor in it! This is the best generals chicken I make it all the time for my family. My husband does not even like chinese food and he loves this and the mongolian beef. I have to say I love this website every recipe we have tried from here we love. I use ground ginger in mine because I did not have fresh ginger you just don’t use as much. Great Great Great!!!! Thank you for sharing your recipes. I made this for my husband and he LOVED it! He now requests it on a regular basis. Thanks for the great recipe! I made this for dinner the other night and it turned out really fantastic – i’m wondering though if you have ever tried to freeze the sauce and if so how did it turn out when reheated? I haven’t but I’m sure it would be fine! Is this dish spicy? Was wondering if the cayenne pepper will be too spicy for my kids (all 5 and under). It is a spicy dish, but feel free to reduce or even leave out the cayenne, it will still be good! I out the pepper and it tasted Great!! My husband loved it!! I’m glad you adapted the recipe to your taste. Thank you for sharing! I want to try this but in my small town u couldn’t find lite soy sauce only the kikkoman naturally brewed soy sauce. Will it work!? That should work fine, you can use regular soy sauce. I don’t have any pineapple juice on hand. What would be some acceptable substitutions? I made a few substitutions and it still came out great. I panfried the chicken without flour to be a little healthier. I only had pineapple and orange juice for the sauce. I added about a 1/2 cup of sugar and to make it more spicy I used about 2 tablespoons of chili paste. You are so right about the cornstarch though! I didn’t realize the heat had to be on low so with my first batch of the sauce I actually cooked the cornstarch. I believe I added 2 tablespoons of cornstarch to make it extra thick in the second batch and it came out just like I hoped! Absolutely delicious and so easy. My picky teenage daughter said it tasted just like the restaurant ! Thanks so much! Can you do any of this ahead of time? I am having a huge crowd for Thanksgiving and everyone is coming in on the Sunday before. I would love to try this the night they arrive. You could probably make all the chicken up and then freeze it– then when company comes you can bake it in the oven to re-heat and add the sauce? I have never done it before but that is how the Chinese chicken at Costco works so I am guessing you can do it at home 🙂 Let us know how it turns out! Delicious and so easy! It has been three years since my husband and I ate Chinese take out and we vowed never to do it again. We were longing for Chinese food lately and still didn’t want to eat take out. I haven’t attempted to cook anything like this because I am unfamiliar with it, and it’s out of my comfort zone. This was so easy! The next time I make it I will probably dredge the chicken in egg first so the flour will stick better. I also bought a ginger paste from the grocery store that I used instead of fresh ginger. It was cheaper, and I knew I wouldn’t use the whole ginger root, and I can save the paste for next time in the fridge. I used 4 lbs of chicken, and i quadrupled the sauce recipe, but I ended up having way too much extra. I also had trouble getting the sauce to thicken, so I added in more cornstarch mixture and I turned up the heat on high and constantly stirred until it reached the desired consistency. I will definitely be making this again! Thank you for sharing. My 14 year old daughter, comes from a long history of family cooks. She made this tonight for dinner, all by herself, and kicked it’s arse!!!! My NEW favorite generals chicken. And by the way…..I AM NOT A CHICKEN FAN!!!!!!! Go my future attorney/chef!!!!!! So gad you liked it! Wow, way to go having a 14-year-old that is so into cooking! That is impressive! I’m so glad you liked this! We love it too! Thank you for your comment! Do not use regular soy sauce! Too strong and terrible. I had to triple the other ingredients to balance it out. How did you get the chicken breading to look so perfect? Your list of ingredients doesn’t contain flower but the instructions state to use flower. Am I missing something? How long does this recipe take to make? Emily, after you cut up the chicken this recipe only takes about 30 minutes to make. Thanks for asking! This was delicious! My family of 5 devoured it. I used 5 chicken breasts which the sauce just barely covered. Next time I will double the sauce, as we like ours a little more saucy. Very good flavor. I didn’t change anything. Thank you for this awesome recipe! We definitely like making extra sauce for that same reason. So glad everyone liked it! Sorry about that! We will get right on it!!! This was delicious, just as good as the restaurant! I’ve made this at least a dozen times and it continues to be a crowd-pleaser! Thank you so much for posting this! Loved this recipe. My only problem was the directions did not say to boil the sauce after adding the cornstarch. I followed the directions & the sauce never thickened. I looked at the cornstarch box & it said to boil for 1 minute. I did that & all was great!! Thanks for this great replacement for takeout. This was fantastic! My husband took one bite and said, “Oh we’re absolutely making this again!” Only change we’ve made is steaming veggies and throwing them into the sauce and chicken. YUM! We love throwing veggies in the sauce too! Pineapple is good in the sauce too 🙂 So glad you guys liked it! Hi do you have Mongolian beef recipe? If so, please share. Thanks! Yes we do 🙂 If you do a search for “Mongolian Beef” it will come up. Hope this helps! I’m making this soon and wanted to know if you only dredge the chicken in flour, or if it needs to be a flour/egg mixture? Also do I only dredge it once or multiple times to get a thicker breading? You can do it either way. I seem to get a better coating if I do egg/flour but it depends how thick you want the breading. You can do it multiple times to get a thicker breading if that’s what you want to do! Yes, you can absolutely use orange juice instead. Hope this helps! I just tried this recipe and I was expecting it to be a little sweeter. On the other hand, my boyfriend loves it. If you prefer your General Tso chicken to be sweeter, you can always add a little extra brown sugar and pineapple juice to the sauce. Hope this helps!